Welcome to A Sampling Bee! Today, I share with you Hungry Harvest. Hungry Harvest is a produce delivery service that delivers recovered produce right to your door. What do they mean by "recovered?" Recovered produce comprises fruit and vegetables that are perfectly fine to eat, but would have been thrown away. These fruits and vegetables are often discarded due to aesthetic imperfections or logistical inefficiencies(when grocery stores order too much). Hungry Harvest believes no food should go to waste and no person should go hungry. For every delivery, Hungry Harvest will subsidize 1-2 pounds of produce for families living in food deserts through their Produce in a SNAP site. Hungry Harvest currently delivers to Maryland, DC, Philadelphia, South New Jersey and Northern Virginia. Get fresh and delicious produce delivered on a weekly or bi-weekly basis. Whichever you prefer. You can also personalize your harvest by letting Hungry Harvest know what kinds of fruits and vegetables you prefer. Hungry Harvest offers USDA certified organic harvests. They can be found HERE. Their other harvests are not 100% organic but they are consciously sourced. Hungry Harvest will send you a weekly "This weeks harvest" email to you so that you know what will be in your harvest. Hungry Harvest also offers add-ons. Like recovered sliced bread, coffee and fresh eggs! Mini Harvests serve 1-2 people, Full Harvests serve 2-3 people and the Super Harvest serves 4-7 peoples. View more individual harvest information HERE. I love Hungry Harvest and everything they stand behind. I love the fact that they do everything they can in order to recover these fruits and veggies. By what I saw in my harvest, I see no reason at all for these fruits and veggies to be discarded. There was absolutely nothing wrong with any of my harvest. To be honest, the fruits and veggies that I got are way better than what I can get at my local grocers. 1.Wash kale, broccoli and tomato. 2. Chop kale(or break apart with hands) into bite size pieces. Removing the stem. 3. Cut tomato and broccoli into small pieces. 4. Add kale, broccoli and tomato to a dish. 5. Cover with your favorite dressing. I used Brianna's Poppy Seed Dressing. This is an easy, light salad that can be customized to your liking. I think kale is so much more yummier than just lettuce. The poppy seed dressing goes great with kale! So yummy! 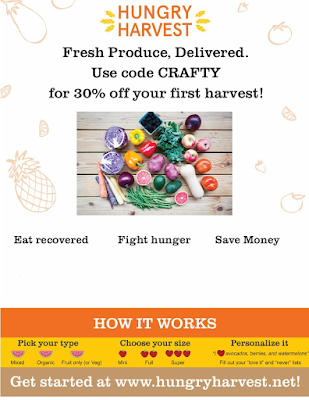 Use my code below to purchase your own Hungry Harvest Box! I received a Full Harvest box in exchange for my honest review. All opinions are my own. Always! May's Degusta Box USA Review & Giveaway!! Mother's Day Giveaway From Fresh Wave!